Canonical's Ubuntu has brought a new definition of “ease of use” to the Linux community. With an intuitive design coupled with an extensive package library, Ubuntu has made the jump from Microsoft's Windows to GNU / Linux that much easier. For those readers that have made the jump: you may have noticed that the default color theme and window decorations are somewhat... ugly. This article will give you a crash course in how to improve your Ubuntu experience by tweaking the interface. 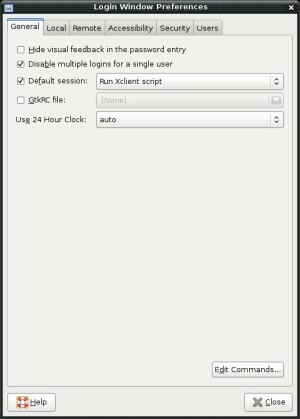 A common request on several internet forums is how to modify the standard login window from the default. This tweak will allow you to customize the login window for your installation of Ubuntu. 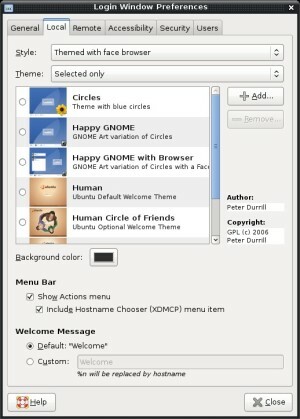 art.gnome.org is a one-stop shop for customizing your GNOME experience. In this example, I decided to install the Sunergos Blue theme by Pyros. In the Theme box, choose "Selected only"
You will need to log out and then log back in to see the effects of these changes.